Proper torque and mass calibration are an essential function for relevant metrology equipment to ensure it displays accurate readings. Regular calibration mitigates or eliminates potential errors caused by inaccurate measurements, improving the repeatable accuracy and reliability of instruments used in critical processes. A variety of instruments utilized in your operation may require precise calibration, including torque devices, load cells, scales, balances, and weights. Our torque calibration and mass calibration services can be conducted on-site at your facility or in our labs. Regional pickup and delivery services are available. Torque calibration must be performed on instruments that apply torque during production stages. During torque calibration, the amount of torque an instrument produces is compared to the allowable tolerance, allowing our accredited staff to determine if the instrument requires adjustment. Torque wrench calibration, for example, ensures the instrument delivers exact tension to the fastener for safety and proper functioning. The torque calibration process ensures reliable measurement and traceability. Torque calibration requirements come from various sources, including manufacturer specifications, federal and international specifications, ANSI/ANME standards, and customer requirements. Mass calibration is used to deliver accurate weights both pre- and post-production for the safety, efficacy, and performance of manufactured goods. Mass calibration ensures instruments and production processes are stable, repeatable, and controlled, providing precision measurements with a high degree of accuracy. 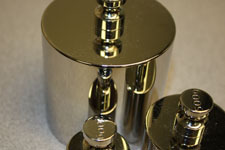 Mass calibration must be performed in a temperature-controlled laboratory to ensure the stabilization of weights and instruments prior to and during the process. A variety of scales and weights are utilized to conduct mass calibration services at a range of weights and accuracies, providing weight comparison via scale compared to mass values or known standards. Torque and mass calibration services ensure accurate and repeatable measurements from your critical instruments. Garber Metrology is available to assist with all your torque and mass calibration needs – please contact us to see how we can help you to get the most out of your torque and mass equipment.